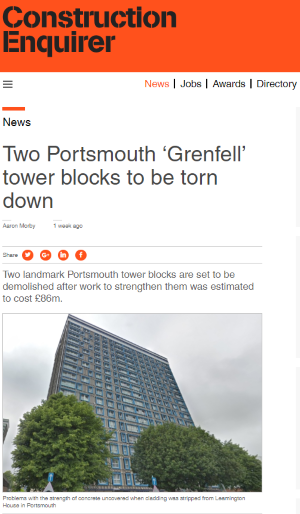 Problems with structural concrete were uncovered when cladding was removed from the two 18-storey towers in Somerstown following the Grenfell tragedy. Detailed structural reports commissioned to decide what to replace the cladding with at Leamington House and Horatia House buildings revealed more deep-seated problems. It is estimated that it would cost around £86m to strengthen the two blocks and the work would take as much as five years. The 800 residents in all 272 flats in the two blocks are in the process of being moved out….